SEGA and M2 have worked together to recreate many classic titles on 3DS. We’ve seen the likes of 3D Sonic the Hedgehog, 3D Gunstar Heroes, and 3D Streets of Rage – among many others. 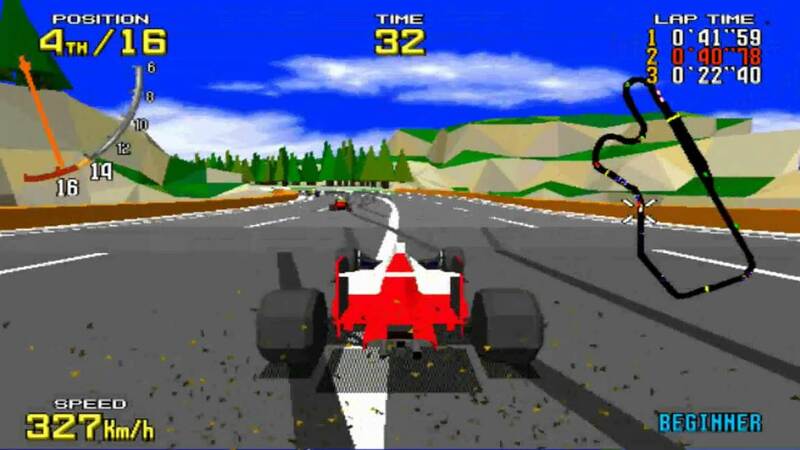 But there’s one title the two companies wish they could have recreated for the handheld: the arcade version of Virtua Racing. Is there a title you wish you could have converted? YO: That would have to be the arcade version of Virtual Racing for me. It hasn’t ever been faithfully ported. There’re four ports to date: Mega Drive, 32X, SEGA Saturn, and Playstation, but none of them stayed true to the original. The Mega Drive and 32X versions were amazing at the time, but I wish more attention went to Virtual Racing rather than Virtual Fighter. I wasn’t too impressed with Winning Run (racing game developed by Namco at the time), which was released earlier, butVirtual Racing really caught my attention. The 30 FPS framerate gave it a smoother effect compared to other games like Hard Driving and Winning Run. There was also a Grand Prix mode, where people could play 15 rounds for 200 yen when popularity started to die. I remember having so much fun playing with three other people and figuring out when to replace the worn out tires at the pits. I do feel that I want to re-experience that some day. Many have told me that there’s no reason to bring it back when there’s so many amazing racing games out there, but I’ve got a lot of great memories associated with that game, so I’d love to bring it back if I had the chance. NH: I got to say, I agree. I’d say Virtual Racing since I like to work on those primitive era games. – Despite this maybe being the end of the SEGA 3D Remaster Project, I really hope you can make those happen. YO: Seriously! But I wonder how many of these “final episode” interviews we’ve had regarding this project. Back during Batch 1’s 3D Streets of Rage episode, I was the one who suggested to put “Farewell!” as the title! I thought that was going to be be the end of the interviews. You can read up on the full interview here. There are lots of interesting comments about the development of 3D Sonic the Hedgehog 2!